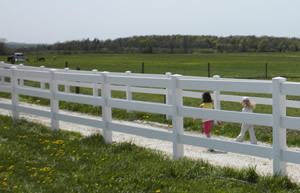 Homestead Fence Company, offering various types of fencing to contain and safeguard horses. 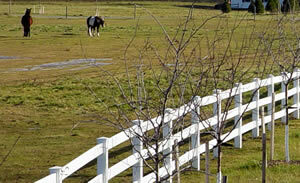 Options for equestrian fencing or horse fencing are extensive. Board fencing can be a good option, as it is a strong fence for corrals and holding, as well as barnyard area. 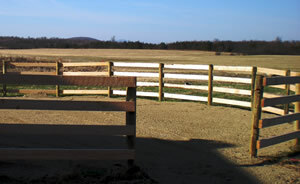 Energized offsets can be added to board fencing as well to help also in the containment of horses. 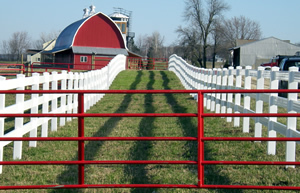 Board fences do not require energy and can be customized through different paint. Board fencing can be expensive to install, as posts must be spaced every eight feet and boards need to be replced over time. 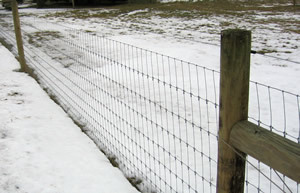 Hi-tensile fencing, also used for cattle fencing, is relatively cheap in comparison to other options. 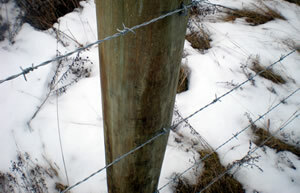 Posts can be spaced 20 to feet feet apart, reducing insallation costs. There are also options to run one to seven strands of the wire. Hi-tensile fencing must be kept electrified, which requires regular upkeep in brush removal so the fence line can remain clear. Hi=tensile fencing may not be suitable for confined areas, and it can possibly injure horses due to its electrification. Woven wire fencing is a strong physical barrier that does not need to be energized. New hi-tensile wires can be installation with little stretching or sagging. Horse-friendly woven wire is an option for keeping horses from getting tangled. Wove wire fences can be relatively expensive due to their durability and strength, as well as labor involved in installation. Rope fencing is relativel cheap to install and is a safer alternative to hi-tensile wire. It has high visibility for the animals and can be tightened very easily. Low voltage electricity can also be added to rope fencing for certain areas, such as proximity to children and pets. Rope fences can also be charged by solar power. Rope fences are more expensive than hi-tensile wire, with the same maintenance options as hi-tensile.